Good morning! Yesterday was my DH, Dan's birthday, and I showed you the card that I made Sabrina to give to her Daddy. Today I'm showing the card that I gave him. I used Mercy's Tuesday Sketch Challenge #55 and kept my card fairly clean and not too frilly (not counting the silk ribbon, which I just couldn't resist adding!). For my "image" I used one of the cut-outs from the My Mind's Eye Be Loved collection. I stamped the frame around it using Very Vintage Labels No. 5 from Waltingmouse Stamps, then I used my Labels Five Nestabilities to cut it out. I added Star Dust stickles to the hearts and a couple of rhinestones for a little bling. Accessories: Labels Five Nestabilities (Spellbinders), Apron Lace border punch (Fiskars), Rhinestones, Star Dust Stickles (Ranger), Silk ribbon (May Ars), Foam tape, Thread, Sewing machine. very pretty ;) I just love that paper!!! AAAAH! This is DREAMY Stephanie!!! LOVE the layout, that big fabulous bow and the paper you used!! FAB!! stephanie...this is gorgeous! 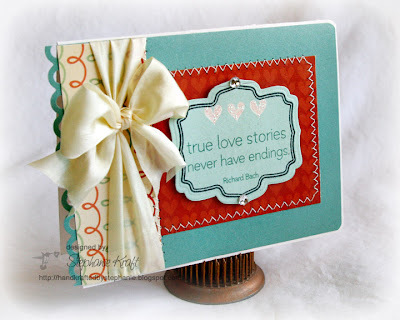 love the stitching, the ribbon, the way you used the border punch, the dp, and that yummy ribbon!